H2O Pro Nathan Breaks Down Hydration! Home › Blog › H2O Pro Nathan Breaks Down Hydration! Meet Nathan, our Sandy Springs H2O pro. 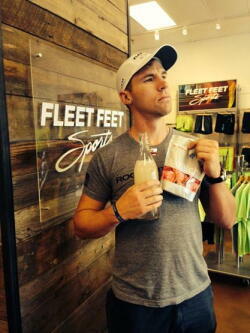 Nathan gives us some great background on three great hydration products. He's the man with the plan that can give you a hydration plan! NUUN: Created by an avid cyclist looking for something to keep himself hydrated during long rides without the sticky mess of normal sports drinks, Tim Moxey came up with a sugar and carb free, portable, self-dissolving and delicious electrolyte tablet perfect for a handheld water bottle or hydration pack. Easy-to-drink flavors like tropical punch and strawberry lemonade keep athletes all over looking forward to the next sip! SKRATCH: The Folks at SKRATCH have finally done it. They’ve created an all-natural electrolyte powder for hydration on-the-go. Loaded with ACTUAL bits of real fruit in each serving, this artificial everything-free concoction has a very natural, clean flavor that delivers a sweet refreshment during exercise due to cane sugar. With flavors like Raspberry and Lemons & Limes it’s a must for any athlete looking for a great organic way to hydrate! ULTIMA: For the athlete looking for a healthy dose of Vitamin C with their water, Ultima shines through with a tasty, sugar free hydration supplement containing EIGHT vital electrolytes. We love the Grape flavor with its sweet and tanginess. Ultima is for people of all ages too, tiny toddlers to Iron Man athletes!